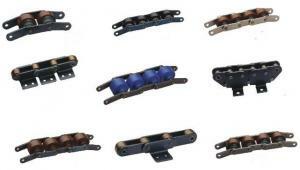 Accumulation chain, is also referred as double plus chain. Products are available both in carbon steel and stainless steel, and are widely applied in the electronics industry to transport consumer products like TVs, VCRs and radios, etc. Rollers can be plastic, carbon steel and stainless steel ones. Safety is ensured by the extra-large, engineering plastic center rollers which allow for installation on a chain cover. For harsh working environment, extra-large steel rollers are recommended.The main specification is BS25-C206B,BS25-C212A and so on. Zhenjiang Fresh Marine Supply Co., Ltd. is a comprehensive company engaged in both manufacturing and trading. We offer a full line of the top-quality lifting items, including chains,anchors,rubber fender,nanocrystalline material,nanocrystalline core etc. The products are exported to more than twenty countries and regions in America, Europe, Australia, Japan, Southeast Asia, South Africa, Middle East, etc. To be definite, our products have gained high reputation among customers overseas due to our reliable quality, competitive price, prompt delivery and good service. Under the principle of "Mutual Reciprocity, Mutual Benefit, Mutual Advances”, we could make our best effort to supply the customers with superior products and service whenever you are in need of our help. "Credit First, Quality First, Customer First" is our everlasting purpose. Welcome customers from home and abroad to visit and negotiate business with us.